It was the demolition of the old wooden grandstand on the south side of Kingsholm in the summer of 2007 which gave rise to Gloucester Rugby Heritage. During the demolition, old photographs, papers and other memorabilia, some dating back to the 19th Century were found in the bowels of the stand, where they had been put by generations of club officials, who did not want them cluttering up their offices, but thought they should not be wholly discarded. Fortunately one of the demolition contractors asked if this material should be thrown away, and it was saved from the skip by the then Rugby Club Community Marketing Manager, Gary Little. He asked Gloucestershire Archives, conveniently just round the corner in Alvin Street, if they were interested, and they launched a recovery operation the same day, which resulted in 31 large boxes being shipped round to the Archives. The County Archivist, Heather Forbes, needed an assessment of the value of this material, and asked the Secretary of the Friends of Gloucestershire Archives, Malcolm King, to take on this task. He formed a small team with two other season ticket holders at Kingsholm, John Theyers and John Cowen, to go through the boxes. 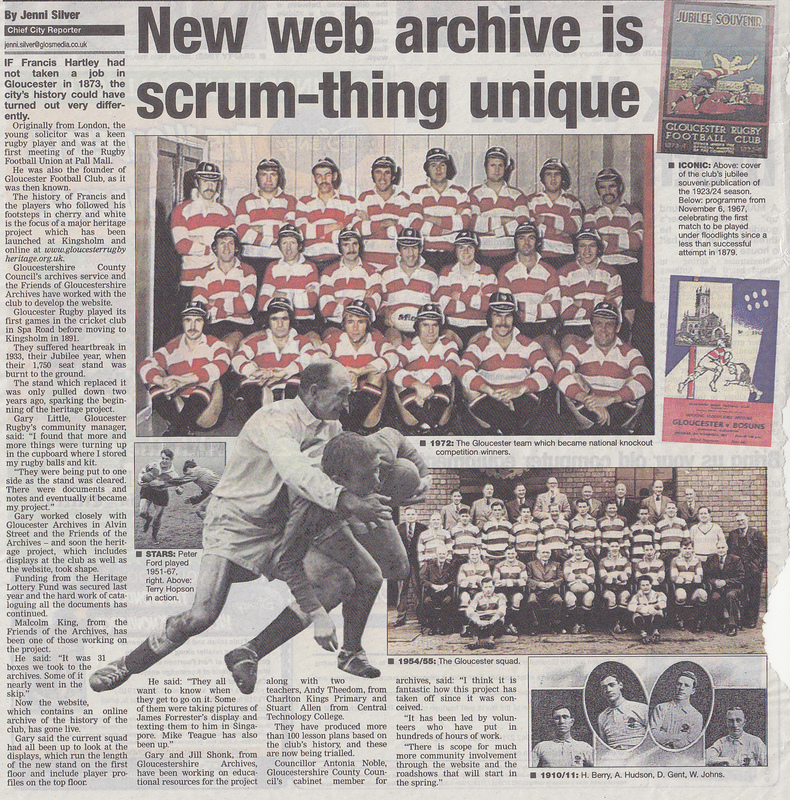 It was concluded that there was indeed much of interest and that it should form the basis of a Gloucester Rugby archive within Gloucestershire Archives. It was decided that an on-line archive should also be established, and that there was plenty of potential for using the material for educational purposes. So the Gloucester Rugby Football Club Community Heritage Project was created as a sub-group of the Friends of Gloucestershire Archives, with Malcolm King as Project Manager, and with Gloucestershire Archives and Gloucester rugby as project partners. All of the material rescued from Kingsholm was catalogued, is stored in climate-controlled conditions to preserve for future generations, and is available to the public. The next step was to secure funding. The project partners donated staff time and some funding, but greater financial resources were clearly needed with such a large range and quantity of material to collate, and the Project’s aims becoming ever more ambitious. It was decided to bid for finance from the National Heritage Lottery Fund (NHLF). In late 2008 the good news came through – the Project had secured nearly £50K from NHLF, to be spent in 3 years, spread almost equally across capital and activity costs. This brought the Project’s total funding to £88K, which was used to finance the delivery of a web site, permanent static displays at the Gloucester Rugby Club, educational materials based tied to the National Curriculum, and temporary displays for use at events. All the objectives of the NHLF funding were met within the three year period. Further growth of the project resulted from follow-on sponsorship by Ecclesiastical Insurance from 2012 to 2015. This allowed additional displays, expansion of the on-line archive, additional educational materials, the subsidy of educational visits and the publication of books. The Citizen and BBC Radio Gloucestershire also supported the project with advice and publicity. Interviews and profiles of former players continue to be added to the archive. Additional material for the archive has been donated or loaned for copying by more than a hundred individuals, including many former players as well as members of the public.